Strapless dresses are hard to avoid if you're attending formal events or dressing for summer. While the silhouette is especially popular, it isn't the most flattering on all body types, especially those with a larger upper body, but even slimmer figures can fall victim to the bunching and bulging of flesh around the underarms which strapless cuts create. That said, there are a handful of tricks to make arms look lean and lovely in strapless shapes. Bras that don't adequately fit a woman's bust will cause skin to be pushed up and out toward the arms. Some stylists believe that a woman wearing a bra band and cup size that are one size smaller and one size larger, respectively, than her usual measurements will help to keep things in place. Specialty bras with side slimmers can also help to keep wandering flesh at bay. Most often, it isn't the body but the dress that causes skin around the arm to pour over the edges of a strapless clothing item. By choosing flattering necklines, women can avoid the appearance of chubby underarms. Sweetheart necklines, for example, are preferable to bodices that cut squarely across the upper torso. When shopping for strapless dresses, make sure to ask for advice from staffers who know what pieces are available and have seen them on a variety of bodies. Seamstresses can also greatly improve the look of a strapless dress with a few minor alterations. 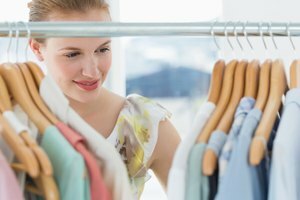 Oprah.com: Your Biggest Dressing Dilemmas—Solved! Times Union: On the Edge: Sleeveless/strapless wedding gowns are bad? !